Brief summary of the paper:Alternative behavioural strategies of colour morphs are expected to associate with endocrine differences and to correspond to differences in physical performance (e.g. movement speed, bite force in lizards); yet the nature of correlated physiological and performance traits in colour polymorphic species varies widely. Colour morphs of male tawny dragon lizards Ctenophorus decresii have previously been found to differ in aggressive and anti-predator behaviours. We tested whether known behavioural differences correspond to differences in circulating baseline and post-capture stress levels of androgen and corticosterone, as well as bite force (an indicator of aggressive performance) and field body temperature. Immediately after capture, the aggressive orange morph had higher circulating androgen than the grey morph or the yellow morph. Furthermore, the orange morph maintained high androgen following acute stress (30 min of capture); whereas androgen increased in the grey and yellow morphs. 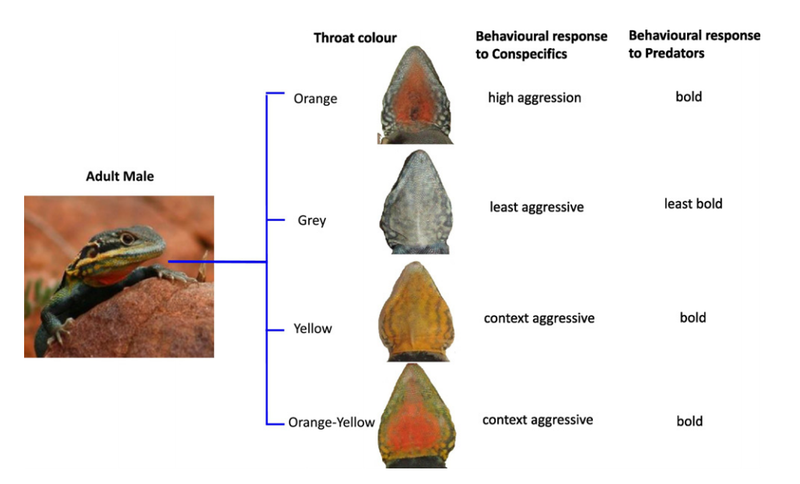 This may reflect the previously defined behavioural differences among morphs as the aggressive response of the yellow morph is conditional on the colour of the competitor and the grey morph shows consistently low aggression. In contrast, all morphs showed an increase in corticosterone concentration after capture stress and morphs did not differ in levels of corticosterone stress magnitude (CSM). Morphs did not differ in sizeand temperature-corrected bite force but did in body temperature at capture. Differences in circulating androgen and body temperature are consistent with morph-specific behavioural strategies in C. decresii but our results indicate a complex relationship between hormones, behaviour, temperature and bite force within and between colour morphs. ← ABC TV Catalyst: Can Seaweed Save the World?